Given their core competencies in market research and analysis, reports, conferences and communications, Analysts rank highest in the early part of the Social Business Life Cycle. Their professional services tend the take the form of executive briefings. commissioned research reports and individualized research channels. Feasibility assesses the adoption of social technologies by a client’s stakeholders, so it emphasizes the market as much as the client’s readiness to implement social business. Although no analyst firm had a detectible Feasibility service offering, it is within grasp of their competencies. Their firm category has a Medium capability. Strategy conducts granular analysis of social venues, stakeholders’ social actions and client assets and business processes; therefore, it requires more specific knowledge of social technologies and behaviors than Feasibility. A valuable social business strategy requires strong knowledge of social business practice, and Analysts don’t exhibit high levels of social business practice, Forrester, Altimeter and Constellation being the exceptions, so they have a Low but discernible capability. Pilot involves guiding clients’ execution of social business strategy, so Analysts have less than Low because they have little if any capability in guiding client social business practice. However, they have higher than None because their employees show a higher than average skill with social technologies, which would enable them to guide client practice in defined areas. Scale focuses on forging mature social business programs by expanding Pilot. This is beyond the demonstrable capability of any Analyst firm studied. None. Integrate evaluates mature business processes in light of social business and integrates them or replaces the mature process with a social business process. This is even less within the capability of Analyst firms, so they had None. Forrester leads Analysts by a wide margin on the strength of its Practice score. The top three analyst firms are tightly bunched in Leadership, which emphasizes talking about social business rather than practicing it. Thought leadership is square in their core competencies. Interestingly, two new entrants, Altimeter Group and Constellation Research Group, are tied for second in Practice. They have relatively young leaders who are using social business prominently. Since they are building their brands, their Leadership scores are relatively low. Altimeter was launched in 2008 and Constellation in late 2011 by veterans of the big three. IDC and Gartner have nascent analyst blog initiatives based on my analysis. They lack useful category and tag taxonomies to help users zero in on specific topics like social business strategy or organization transformation. Worse, Gartner analysts tag and categorize individually, which sabotages usability. Forrester’s blogs are one or two generations ahead. 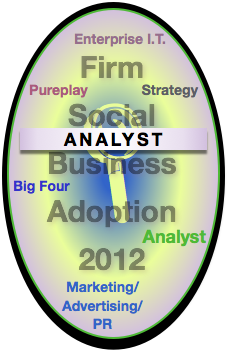 Relative to other firm categories, though, Analysts are ahead with using blogs and other social platforms. Yankee lags in social business adoption as its scores were markedly lower than its rivals. That said, its Momentum score shows strong growth, so it seems to be getting on the social business bandwagon. NM Incite is an alliance between Nielsen and McKinsey that focuses on social media analytics, so it is not a traditional analyst firm like the rest of the cohort, but it is included here due to its focus on analysis and market research.
? As discussed in Capabilities, Analysts address a fairly narrow part of the social business life cycle, but they can add significant value to your social business initiative if you know what to expect. Here are my general recommendations for working with an Analyst firm on social business initiatives that emphasize organization transformation. Many readers are undoubtedly Analyst clients and regularly attend their conferences in which Chief Analysts present case studies and co-present with clients who are practicing social media and social business. Analysts are recognized thought leaders and are very knowledgeable about emerging trends involving social technologies. Analysts offer clients an interesting mix of three ingredients: Strong understanding adoption trends, market forces and some of the technical aspects of social technologies, minimal experience with advising clients on the practical uses of social technologies, and strong Practice skills. Intriguingly, Analyst firms themselves use social technologies more effectively than Agency, Strategy or Big Four firms. Analysts in particular are strong in research and synthesis, remaining in the abstract. Theoretically, that enables them to cover emerging trends and to inform their clients more effectively. Social business uses digital tools for social transactions, but humanness and sociality are the differentiators; the technologies just provide mechanical tools to communicate and share being human. There is very little awareness of sociality anywhere, especially in consultancies. Humanness is something people “practice” largely unconsciously, so it represents implicit knowledge and skills. To leverage its power, organizations and individuals must make it explicit to speed their learning process. Keep in mind that one of the biggest risks is thinking you’re taking advantage of social technologies where you are not. Many of the social media early adopters who emblazon the covers of publications and conference podiums have succumbed to this pitfall. That’s not the meat, they are eating the bun. Do not pick a “type” of advisory firm; look for a balance of leading edge thought leadership and walking the walk. Among the Analysts studied, Forrester is the standout if you want an established brand. Regarding disruptions like social business, “established” is not generally a good indicator for relevant expertise. Given that Practice is so important, consider Altimeter and Constellation, which trail Forrester’s Practice score by single digits. Partnering with a new firm can be the best choice if you manage your side of the relationship appropriately. You may well find more bleeding edge thinking and practices at the new firms, but they generally suffer from a lack of support and consistency in their business processes. I speak from experience because CSRA is a boutique. Ask about these and pay attention to body language. Make sure people are being transparent. Even more important, own your organization’s journey, don’t abdicate to any advisor. Analysts’ strongest capability is noting, interpreting and advising on emerging trends, so they can be valuable partners. As Score Distribution indicates, think to use Analysts during Feasibility and some aspects of Strategy, where their capabilities resonate strongest with the Social Business Life Cycle. It would be easy to partner with an Analyst to talk about and understand more than practicing social business. Few organizations appreciate the necessity of practice. Look for individual analysts who put themselves out there, usually via blogs, but also in Twitter, on YouTube and on social networks. SWOT analysis can be a useful tool to understand advisory and services firm strengths and weaknesses, especially to executives and professionals who have used it, so I have summarized Analysts’ as a firm category in the table. Assessing market trends specific to technology maturity. Noting and predicting technology adoption by market participants. Preparing, producing and delivering a wide range of thought leadership. High scores in Leader blogs, Sociality; most employees are communicators. Advisory capabilities limited to research and some strategy. Not experienced with leading clients through business process and culture transformation. Little core competency to grow into “hands-on consulting” that clients require. Developing sophisticated metrics and understanding of sociality; most social media metrics are of nominal value because they don’t reflect changing trust, relationship and commitment. Distilling good practices from employee skills with social technologies. Offering good practices to clients as a consulting offer. Technology vendor selection may become less important as technologies go cloud and are available in small increments. This may lower market demand for technology analysts. “Open source” collaboration with social technologies could weaken some Analyst research offerings in some use cases. 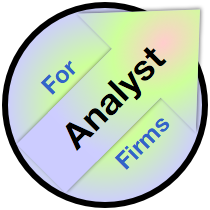 Strengths of Analyst firms have been discussed at length but are included for completeness. Weaknesses have been mentioned, but clients can mitigate Analysts’ weaknesses as long as they recognize them and get Strategy, Pilot, Scale and Integrate expertise elsewhere. Beware of Analysts that may claim expertise they are growing into. All advisors learn during client work; just be sure you understand their level of expertise. Analyst firms that want to expand into Strategy can be congruent if they make this explicit. CSRA, for example, has a Beta Program for new offerings. We disclose to clients why we think we can add value, but we share that it’s a new area, and we charge them a special Beta Program rate. Opportunities are exploding for Analyst firms. Social technologies accelerate market volatility and change, as described in the Social Channel. Their research and analytical capabilities are becoming more relevant, especially for Analysts that pivot toward sociality, which will usurp value from “technology” tools. Cloud will homogenize technology, so fewer clients will require the level of analysis they do today. However, sociality is far more complex and nuanced. Analysts can innovate by partnering with clients to develop metrics for sociality. The metrics used in this Research Survey can serve as an example. In addition, Analysts may want to experiment with mentoring clients in executing Strategy during the Pilot part of the life cycle. There is a huge vacuum in sociality that Analysts could exploit, but capitalizing on it may require a significant culture change. Threats are largely grounded in Analysts’ traditional focus on technology. If Analyst executives are snoozing, they may awaken to a bloody ocean. More than most, however, Analysts are aware of market developments. Social business will transform society and business because it changes the economics of relationships. Generally, volatility is beneficial to Analyst firms because it creates more change about which clients require education and guidance. That said, the kind of change that makes a difference is changing. Please accept these as general recommendations; each firm is different. Since Analyst firms are strong in their own skills with social technologies, think about codifying staff skills and creating consulting offerings, especially in the Strategy part of the Social Business Life Cycle. To the extent that your firm is grounded in “information technology,” treat it as a cash cow and note the blood in the water. Careful management can maintain technology-related profit margins for years to come, especially when Analysts focus on homogenizing technology. Fall out of love with the technology itself, however. If your firm’s mission abstracts above the technology, it is likely that you are about empowering clients to use the tool to achieve a business impact. Most Analysts have been relatively hands-off with Practice. Consider developing explicit social business Practice expertise as discussed in this Research Survey. A good start would be codifying your employees’ skills and practices with social technologies. Once codified, you would begin exploring service offerings. As will unfold in this research survey, Analysts don’t have the mental baggage of the Big Four firms, whose audit and tax practices are regulated. Analyst firms have more mental mobility. However, I have seen most major firms try their hand at “consulting,” taking a more hands-on advisory role. It has not worked in general, but that doesn’t mean it can’t. Management consulting, whether at Strategy or Big Four, is largely grounded in quantifying analysis. This will be of limited value in social business, which is about scaling trust and relationship with digital tools. Therefore, astute Analyst firms could be strong players in the huge vacuum that exists today. Firms that want to be strong players will invest aggressively. Anticipate and empower culture change. Analysts epitomize “knowledge workers” and increasingly have individual reputations that may dwarf organizations in fast-developing areas like social business. You will be better able to engage stars if your firm redefines itself as a platform for individual analysts to develop their careers. Optimize your roles to empower individuals. This requires jettisoning paternalistic attitudes that pervade Analyst firms, agencies and consultancies. Basking in the water that gets ever-so-warmer each quarter. Those who do will end up on the plate. Not letting go of technology. Again, Analyst firms will make extensive profits covering technology, but make sure you’re grounded in the sunsetting reality (for most of your offerings). Practicing social media and thinking that is “keeping you current.” The market validates social media because it hasn’t discovered social business yet. Sociality, relating to people, is far more complex and nuanced than promoting things to people. Make sure your organization appreciates the difference.